Any tips on cutting latex for thickness rather than length or width? I have a 3″ thick slab that I will need to cut to different thicknesses to reupholster a chair…the seat cushion needs to be 4″ thick, and the back, arms and wings will be 1-2″, not including the wool batting. I have an electric knife, but as I’m effectively cutting “blind” I won’t know if I’m holding the knife level until the cut is done. I’m thinking of using a thin wooden (lauan) board to help keep the blade level, but I don’t know how helpful this will be. Thoughts? Ah, cutting horizontally is quite tricky as you describe. Your idea of the wooden board is probably the same idea that I’m having: using a support for your blade or handle to help you keep it level. Say you wanted a 1″ deep cut and you had a 1″ x 1″ stripe of wood that you placed just on the edge of the latex under your blade. Note though, the wood’s presence would shorten your cut as it would remove the 1″ or so of usable blade resting on it. When we have angled cuts that are shorter than our blade, we draw lines on both sides of the foam. Then one person guides the bottom of the blade and another person operates the saw. Usually our horizontal cuts are made with a saw the size of two cars. The latex lays flat on the table and the long blade cuts the entire piece in seconds. Don’t try a hot wire on latex. It will create quite a stench and break your wire. I was wondering if a wire – e.g., a long piece of metal twine, but not a hot one – would be better as it would be more like one of those long, crosscut saws used on old-growth trees. I’ve made some headway with the electric knife, but as this is a twin-sized mattress that I’m cutting the top 3″ off (as the rest is memory foam) I still have a ways to go. I managed to cut it reasonably level around the edges, to the depth of the blade(8-10″), and now I’m using a 3″ wide board to insert between the layers and cut farther and farther underneath. I have to stop and let the knife’s motor cool off and my shoulder rest (from holding up the top layer as I cut) after several minutes. It won’t be perfect as I keep making hacks and slices into the lower layer, which affects the leveling of the board. Hopefully once I’ve freed the latex and cut it vertically(!) into smaller pieces, splitting them horizontally won’t be as much of a challenge. Perhaps a cool wire would work, the trick would be getting it stiff enough while being sharp and thin. I know an upholster in town who uses a piano wire as his hot wire. I can’t quite imagine it working cold, but it is worth a shot. I’ve even used a sharp serrated knife that didn’t leave a smooth cut but it was sufficient. I’ve tried the method you’re describing with similar results, not exactly a smooth cut but perhaps manageable if the piece is for yourself. So now that I’m done removing the latex layer (it was a hack job but I more or less got what I wanted), my electric knife has pooped out in the middle of cutting the sheet into smaller sections – the easiest part of the task. The knife was by Hamilton Beach, given to me from someone who was downsizing, so it’s no real loss; but I need to replace it now with something that doesn’t overheat so easily. (I did notice it heating up during the horizontal cutting but stopped several times to let it cool down for a few hours before resuming.) I’ve looked at a couple of filleting knives, which appear to be more durable; do you have any recommendations? As I imagine you do this on a regular basis I doubt you tolerate having to run to the big-box store every week to buy another cheap electric knife. Yes, that is the way of kitchen electric knives. They can overheat. I use a Bosch foam cutter for my hand cuts but that will run you around $600+ for all the parts (blades and foot are sold separately). I had luck with this Oster knife for a few years before I upgraded. I have never tried a fillet knife, but in a pinch once, I used a very sharp serrated bread knife but I did have to saw through the piece. Electric knives leave a smoother cut, especially the Bosch with its extra fine teeth. Well I decided on a Heavy Duty Electric Fillet Knife by Rapala, based upon reviews – one person even specifically recommended it for cutting foam. It has a heftier motor than typical electric knives, it never has to be oiled (according to the instruction manual) and longer blades can even be ordered. It even has a safety lock on the switch. I ordered it through Amazon Prime for $50, and when it arrived (and after I wrestled it out of the plastic packaging) it made short work of my remaining cuts. My dog’s bed is now assembled (I’ll try to send a pic along soon) and the other pieces are awaiting their wool batting wraps (protected by the mattress cover in the meantime). I should be able to shave off the remaining memory foam now that the pieces are smaller, and I’ll be making more horizontal cuts as 3″ will be overkill for most of the chair’s surfaces. Thanks much for sharing. I’m glad that new knife worked out well for you. I’ll keep your success around to share with others as needed. We would love a picture of your DIY dog bed! It is inspiring to see everyone’s projects. It sounds like you are going to have a plush, comfortable build. Happy cushion making. Honestly, the use of a little saw or knife is a bit silly, and not needful at all. I just took a 96″ long 1/2″ wide bandsaw blade (available at most hardware stores…I just used an old one I already had) break it at the weld, then whipped up a crude horizontal buck saw something like this https://s-media-cache-ak0.pinimg.com/originals/c9/a3/5a/c9a35a1eafff80688ff8c351fa40daba.jpg . Horizontal means I mounted the blade sideways instead of vertical. 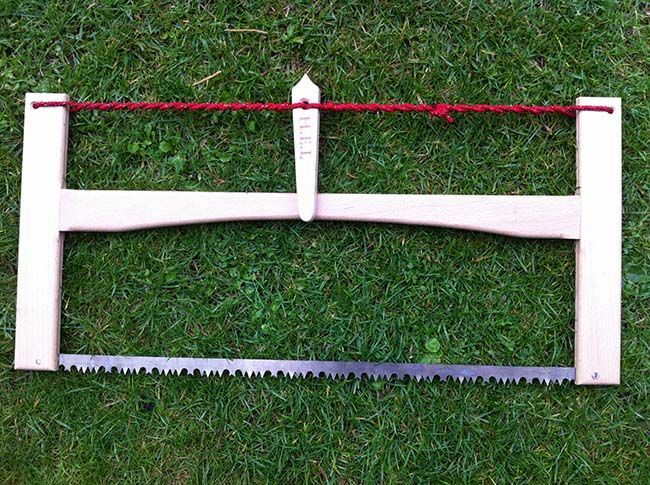 Basically it is just a typical 2×4 stud with two pieces mounted on either end to make a long low “H” shape, the blade clamped to the bottom part, and a string on the top that tensions the blade by means of twisting (‘spanish windlass’). By not mounting the blade on the very bottom, I could have that distance determine the height of the cut. An 8″ latex mattress does not move around very much, so, by laying the mattress on the concrete floor, and sliding the saw back and forth (helper on the other end), I was able to rapidly and accurately cut 1″ slabs off of the *bottom* of the mattress. After each cut, you just flop the whole mess around to get the cut piece off the bottom, and you are ready to go again. I cut off three layers, and there is very good accuracy in each cut. Not as quick as a giant horizontal bandsaw at a mill, but not a long-term exhausting project either. A queen-size mattress was 60″ wide, but we still had more than a 20″ stroke per cut that moved through the material pretty darn quick. I had originally planned to make a big jig with slide rails and all that junk to keep everything aligned, but the real tool turned out to be very very simple. Now I have an 8 foot-long saw standing in the corner, instead of a big mess and a giant useless and overly hard, over-thick latex mattress. The next goal is to take a 1/2 hole punch used for grommets and leatherworking to make the perforations larger, and hopefully soften this stuff up some! The blade I used was a fairly worn 4TPI (four teeth per inch). Now there are some DIY skills. Thank you for sharing. DIY skills indeed! This post inspired me to build a 93″ horizontal saw myself, using a 2×4, a band saw blade (6 TPI) from Home Depot, and some misc. bolts and brackets. 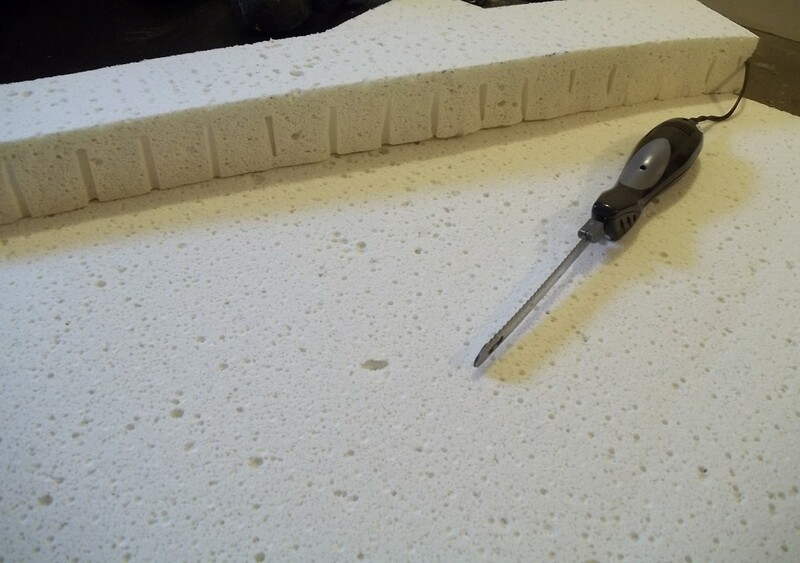 I needed to make a cut in 3-part foam RV mattress that was 4.5″ thick, and I wanted to cut it at 2″ up from the bottom where the first layer was glued to the 2nd layer. It worked OK, but the saw created a lot of little foam “sawdust” that took a long time to vacuum up. I used twine to tension the saw blade. If I used the saw again I might try something I could cinch even tighter, as the blade did ride up and down a bit, leaving little waves in the cut surface. Sounds like a great build and good use of creativity. I hope your RV bed is very comfy now. Thanks for your amazing, detailed and generous instructions. I followed them closely, including buying the Oster knife you mention. I’m totally happy with the results. Instead of two tables, I used two flat doors on my floor (left over from a closet remodelling project). I protected the floor from the knife edge with a length of thin hardboard. I now have really comfortable, natural latex sofabed cushions, replacing memory foam cushions that had given me a serious rash. Fantastic! I’m glad the instructions were helpful and you were able to make them your own. Enjoy your new cushions! I highly recommend NOT using a hot cutting edge on the latex. Unless the heat is very low, the heat will burn the latex and leave a horrible smell that will make you want to discard the entire piece. I have tried having my latex cut with a hot wire and even on the low heat ends that didn’t burn the latex, the density of the latex was too much for the wire and it snapped again and again. These were wires that worked all the time on conventional foam. Fantastic! I’m glad you find something that could work for you. I don’t have an electric knife in my kitchen, but I do have a sawz-all in my garage. I know they have blades for wood, metal, plastic, but I’m not sure if this method is comparable to the recommended one. A sawz-all could do the trick as long as the blade is long enough. It certainly is sharp enough. I am not familiar with how fast or how strong (maybe too strong?) it moves, which might be the only question, however, if it can cut wood, then I suspect it can cut foam. Denser foams are easier to cut than soft pieces as they have less jiggle. I suggest starting with a firm, extra or hard if possible.